Spencer Nursery School is a local authority maintained nursery school committed to delivering high-quality affordable childcare and education for children under five. Visits any weekday morning between 10.30am and 11.00am are welcomed, with no need to book. We hope that you will choose this school for your child and look forward to working with you and your family in the future. 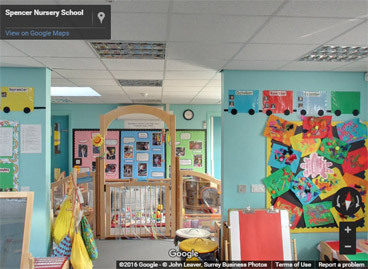 Click here or the image above to take a tour of the school. The school takes notice of and adheres to all the national and local policies and guidance in regard to Safeguarding Children and Young People.